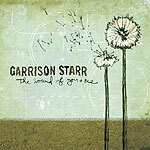 CD review: "The Sound of You and Me"
The promotional materials and Web site for singer-songwriter Garrison Starr's newest album reek of the sort of self-absorbed earnestness that make it so easy to parody the whole coffee house folk music scene. How many of us really want to hear another middle-class 20-something bare her or his soul? Those who can get past all the earnestness and make it so far as popping the disc into their CD player are likely to be surprised at how good her new release is, though. Possessed of a lovely voice and the ability to write gorgeous melodies, Starr's music is utterly charming. Intriguingly arranged, lovingly caressed by those gorgeous pipes of hers, each song is a little gem of accessible ear candy. Accompanied mostly by acoustic guitar and drums, Starr and her producer aren't above inserting strings or other instrumentation if that's what it takes to make a song work that much better.